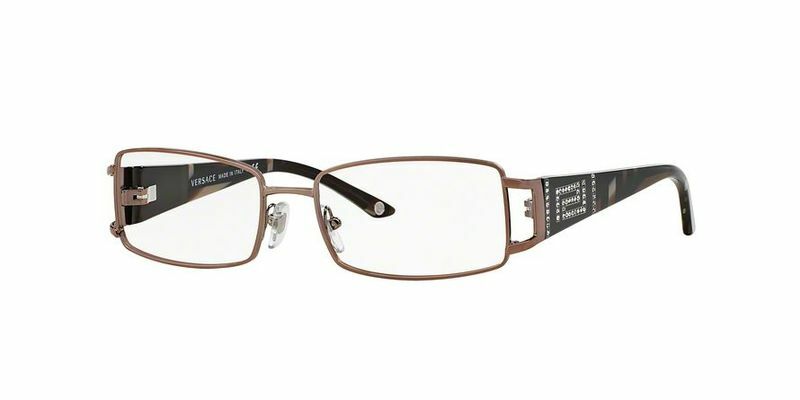 You like luxury and the finer things in life, which is why these simple yet chic Versace VE1163B frames for women will add the finishing touch to your look. The plastic metal frames and the metal temples mean your new pair of eyeglasses will not only be modern and stylish, they'll also be practical and functional. Adjustable nose pads for your glasses are the ideal solution if you want your eyeglasses fully customized to fit your face. You'll fall in love with these classic full-rim frames as soon as you try them on. The classic design suits most people, making these some of the most versatile eyeglasses on the market. If you're going for a more structured architectural look, these rectangular frames are perfect. These strong Versace VE1163B frames are resilient and durable, which makes these the ideal glasses for sporting enthusiasts. Offset your rounder features with a pair of rectangular glasses and stand out from the crowd. Classic is back in fashion with a vengeance, and this includes incorporating a classic Versace VE1163B eyewear look as well. You can't really go wrong with these elegant frames, and we'll let you in on a secret; they could be your answer to success. All quality glasses should sit well on the face, which is why these medium temple Versace VE1163B frames will sit perfectly on your nose.